Owner Brad Schmitt shows The Local his tuxedo stripe shorts. A new store selling military-inspired clothing has marched onto East Ninth Street. Cadet carries a line of menswear that’s hand-crafted by the owners along with four sewers in a Bushwick, Brooklyn factory. 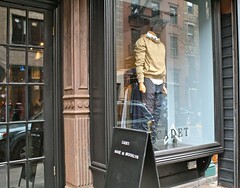 The brand launched with a Williamsburg store in April of last year and expanded into Manhattan last weekend. Cadet stocks a few basics year-round (their oxford shirts are occasionally featured in “spot colors”) but most items are produced in small numbers — so once they’re sold, they’re gone forever. Prices range from $100 to $250 for pants and anywhere form $40 to $150 for shirts. The label’s Camouflage Collection will hit stores next month. Correction: March 6, 2013. This post was revised to correct an error. Brad Schmitt is 39, not 35. Previous post Emergency On East 10th Street? Next post Will Yet Another Building Change Hands On East 14th Street?